Today, the Lush campaign returns to shop windows across the U.K. The decision to suspend the window campaign last Friday was made by Lush, for the safety and well-being of their staff. In some stores, they had been subjected to aggressive behaviour and verbal attacks from angry critics. Like other #spycops campaigners, we condemn the bullying and harassment of people in their work-places. As we and Lush have been saying ever since Friday, “the conversation continues” – we are campaigning as hard as ever, and have been boosted by all the public support that we’ve received. 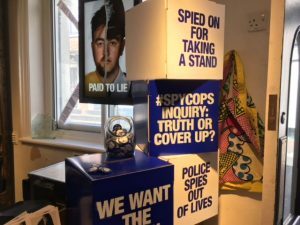 The manufactured ‘controversy’ led to Lush’s latest window campaign becoming front-page news, and many more people learning about the shocking #spycops scandal for the very first time. “The police’s attempts to suppress the truth have totally back-fired”. The short film made to accompany the Lush campaign has received almost a million views, thanks in part to the Daily Mail and others embedding it within their reports. The podcasts have been listened to tens of thousands of times. We’ve seen an unprecedented level of interest in our work, and like the Campaign Opposing Police Surveillance, have more followers and supporters than ever before. The aim of the campaign was to convince Home Secretary Sajid Javid to take action about the crisis engulfing the Undercover Policing Inquiry. Many of the Non State Core Participants have lost faith in its current Chair, which prompted a well-publicised walk-out on 21st March, and, like Neville Lawrence, are threatening to withdraw entirely from the process unless changes are made. “While I accept that those members of the public with no knowledge or understanding of the wrongdoing perpetrated by these units may have initially misread the central campaign image, I do not believe this is true of the Home Secretary. He understands exactly what this campaign is about. He knows exactly what we’re asking of him, and instead of responding to requests to discuss our concerns, he ignores us and rubs salt into our wounds by attempting to de-legitimise our campaign aims. Postcards addressed to Javid, with these demands, are available in Lush stores for members of the public to sign. An online petition has also been set up to accompany the postcards. We would like to thank Lush and all of their staff for supporting our cause. We look forward to seeing how the public react to the new posters, which are going up across the land this morning. “The public inquiry into undercover policing must not be allowed to fail. It is common sense that in order to be able to give evidence, about what an undercover officer did while deployed, you need to know their name, what group they were spying on and what year the year they did so. However the current Chair of the Inquiry refuses to tell us anything at all about so many of these officers that there is no way for us to actively and meaningfully participate in the process. His attitude has led to a loss of faith amongst those who should be at the very centre of the Inquiry: those who were spied upon. Mitting has made it clear that he doesn’t believe our involvement is needed. We know that without our input, there is no way this Inquiry will be able to expose the truth. 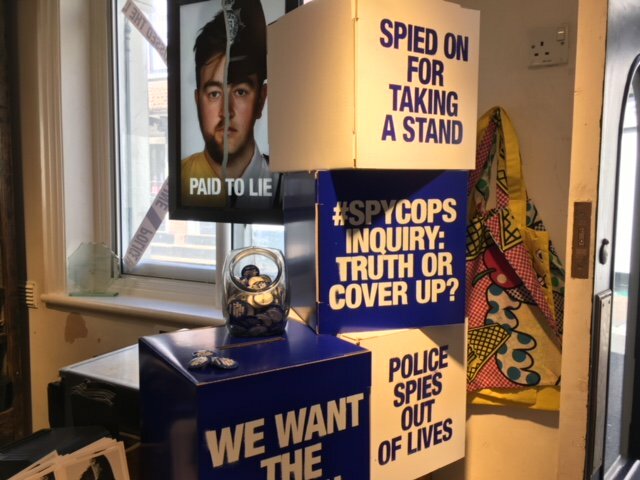 As Peter Francis -and indeed, anyone who’s taken the trouble to investigate the #spycops hash-tag featured prominently in Lush’s window displays and on their website- well understands, this campaign is very specific: it’s about the intrusive, abusive political policing units (like the Special Demonstration Squad, the one he was part of) and the behaviour of both the officers deployed undercover and their managers. These ‘spycops’ officers were recruited, trained, specifically instructed/ encouraged to, and most definitely paid by their employers to lie. (It’s estimated that it cost roughly £250k/ year for each officer deployed undercover in this way). We were under the impression that the vast majority of police officers are under oath and officially employed to tell the truth, so were a little flummoxed that some of them jumped to the conclusion that these posters were about them. We want to know who authorised the human rights abuses, the miscarriages of justice, and all the other ways in which the police can be quite rightly accused of ‘crossing the line’. We’re hoping that Sajid Javid takes the action necessary to get the Undercover Policing Inquiry back on-track, and prevents it from becoming yet another expensive failure. “It saddens and frustrates me that in a time of limited resources, where budgets in the public sector are constantly being cut, that over £10 million has already been spent on the Public Inquiry, yet it has not heard any evidence. For the women affected, it’s important that the Inquiry provides the answers they need, not just about the individuals who infiltrated their most intimate lives but about the handlers, the managers and the back-room staff. “We need this inexcusable intrusion into the lives of activists, exercising their democratic right to protest, to cease to be a part of policing methodology. We need to know who authorised and oversaw these deployments. The tops of the trees need to be shaken. Much of the manufactured ‘controversy’ about the Lush #Spycops campaign seems to be orchestrated by members of the ‘police family’. More decent, thoughtful members of the police community have come out, like whistle-blower Francis, and publicly condemned the misconduct and sexual abuse perpetrated by these notorious units. Those police representatives who fail to condemn these abuses do appear to condone them. The barrage of criticism aimed at Lush, and the level of intimidation faced by their front-line staff, has resulted in a new public perception, of the police closing ranks and refusing to accept any criticism at all, however justified or necessary it may be. The deflection tactics we’ve seen over the last few week do seem to have back-fired badly, with members of the public taking to social media to describe it as “dystopian” and “ironic” that stores have been pressurised to take down posters. 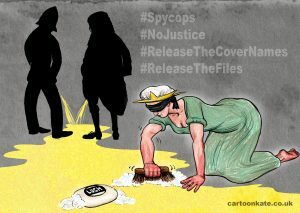 The reactions make it clear that the police, as a body, have not eradicated institutional sexism and racism, two issues at the heart of the spycops scandal (and precisely why we are demanding that the Home Secretary appoints a panel, to investigate these things) and are not willing to come clean about the (ongoing) surveillance and infiltration of groups working for positive change. This is why a proper, transparent, public inquiry process – that will uncover the truth and expose the wrongdoings of the past – is sorely needed, not just for England & Wales but also for Scotland & Northern Ireland. 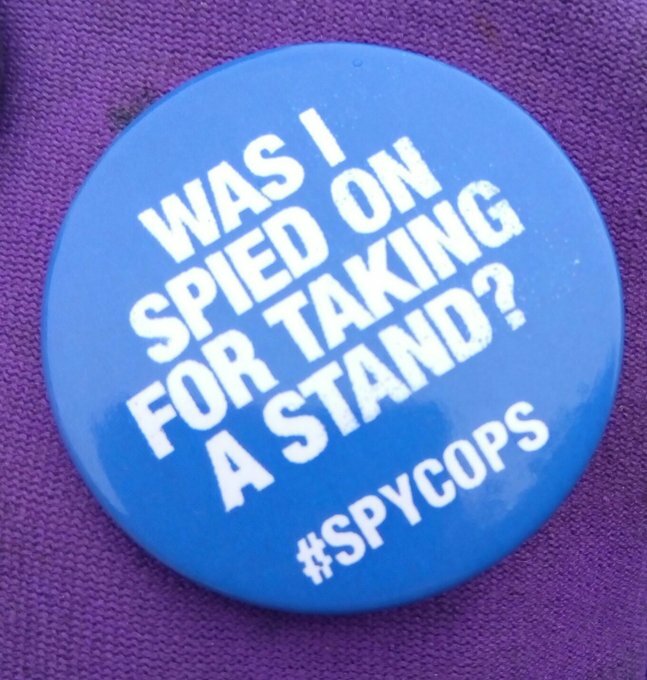 What next for the #spycops campaign?